George Washington Gale Ferris Jr. (February 14, 1859 – November 22, 1896) was an American civil engineer. He is mostly known for creating the original Ferris Wheel for the 1893 Chicago World's Columbian Exposition. Ferris was born on February 14, 1859, in Galesburg, Illinois, the town founded by his namesake, George Washington Gale. His parents were George Washington Gale Ferris Sr. and Martha Edgerton Hyde. He had an older brother named Frederick Hyde, born in 1843. In 1864, five years after Ferris was born, his family sold their dairy farm and moved to Nevada. For two years, they lived in Carson Valley. From 1868 to 1890, his father, George Washington Gale Ferris Sr., owned the Sears–Ferris House, at 311 W. Third, Carson City, Nevada. Originally built in about 1863 by Gregory A. Sears, a pioneer Carson City businessman, the house was added to the National Register of Historic Places for Carson City on February 9, 1979. Ferris Senior was an agriculturalist/horticulturalist, noteworthy in Carson City's development for much of the city's landscaping during the 1870s, and for importing a large number of the trees from the east that were planted throughout the city. Ferris left Nevada in 1875 to attend the California Military Academy in Oakland, where he graduated in 1876. He graduated from Rensselaer Polytechnic Institute in Troy, New York, in the class of 1881 with a degree in Civil Engineering. At RPI he was a charter member of the local chapter of the Chi Phi Fraternity and a member of the Rensselaer Society of Engineers. He was made a member of the Rensselaer Polytechnic Institute Alumni Hall of Fame in 1998. Ferris House, his home at 1318 Arch Street, Central Northside, was added to the list of City of Pittsburgh Designated Historic Structures on June 28, 2001. After the fair closed, Ferris claimed that the exhibition management had robbed him and his investors of their portion of the nearly $750,000 profit that his wheel brought in. He spent the next two years in litigation. Ferris Sr. died in 1895, followed soon after by Ferris Jr. himself, on November 22, 1896 at Mercy Hospital in Pittsburgh, Pennsylvania, of typhoid fever. His ashes remained at a Pittsburgh crematorium for over a year, waiting for someone to take possession of them. Google honored George Ferris on February 14, 2013, his 154th birthday, with an interactive doodle on its front page. ^ a b "Inventor Ferris is Dead. The Man Who Built the Great Wheel for the World's Fair". New York Times. November 23, 1896. Retrieved 2008-06-07. George W. G. Ferris, the inventor and builder of the Ferris wheel, died to-day at Mercy Hospital, where he had been treated for typhoid fever for a week. The disease is said to have been brought on through worry over numerous business matters. He leaves a wife in this city, and friends in mechanical and building circles all over the country. ^ Eighth Census of the United States, United States Census, 1860; Galesburg, Knox, Illinois; roll M653_195, page 1014, line 21, Family History film 803195. Retrieved on 2013-02-14. ^ Eighth Census of the United States, United States Census, 1860; Galesburg, Knox, Illinois; roll M653_195, page 1014, line 24, Family History film 803195. Retrieved on 2013-02-14. ^ "Historic Buildings". Visit Carson City. Archived from the original on 2013-01-16. Retrieved 2013-02-17. ^ "George Washington Gale Ferris Jr – Carson City Nevada Convention and Visitors Bureau". Visitcarsoncity.com. Archived from the original on 2013-02-04. Retrieved 2013-02-17. ^ "Famous Chi Phis". Archived from the original on 2012-12-16. Retrieved 2012-12-28. ^ a b "Alumni Hall of Fame". Rensselaer Polytechnic Institute. Retrieved 2007-12-22. ^ "Doodles Drafts and Designs". Industrial Drawings from the Smithsonian. Smithsonian Institution Libraries. Retrieved 2007-12-22. ^ Larson, Eric. The Devil In the White City. 1st ed. New York, NY: Vintage, 2004. Print. ^ Anderson, Norman D. Ferris wheels – an illustrated history,. Books.google.com. Retrieved 2013-02-17. 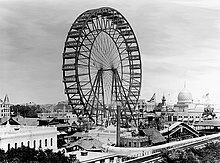 ^ "Chicago's Great Ferris Wheel of 1893". Hydeparkhistory.org. Archived from the original on 2013-01-18. Retrieved 2013-02-17. ^ "George W. Ferris". Inventor of the Week. Lemelson-MIT Program. May 1996. Retrieved 2007-12-22. George Washington Gale Ferris was born in Galesburg, Illinois in 1859 and he and his family moved to Nevada when Ferris was five years old. He attended high school in Oakland, California before enrolling at Rensselaer Polytechnical Institute in Troy, New York, where he graduated in 1881 with a degree in engineering. Ferris found civil engineering work in Pittsburgh, where he specialized in constructing steel frameworks for bridges and tunnels. ^ "Ashes of George W.G. Ferris. Report that a Pittsburg Undertaker is Holding Them for Payment of Funeral Expenses". New York Times. March 8, 1898. Retrieved 2008-06-07. ^ Chase's calendar of events 2009. Books.google.com. Retrieved 2013-02-17. ^ "Google celebrates George Ferris' 154th birthday and Valentine's Day with a doodle". Retrieved 2014-01-17. Weingardt, Richard G. Circles in the Sky: The Life and Times of George Ferris. Reston, Va.: American Society of Civil Engineers, 2009.
Notable Names Database: George Ferris – aka George Washington Gale Ferris Jr. This page was last edited on 4 January 2019, at 05:03 (UTC).